Like a real account with a brokerage, your StockMarketEye portfolio contains a pool of un-invested funds called the cash balance. In a real brokerage account, these funds are usually held in a money market account or interest bearing account. The “Cash” line of your portfolio (just above the “Total” line), represents this un-invested portion of your portfolio, whether it is actually in a money market fund or an interest bearing account. The cash balance of your StockMarketEye portfolio is where the proceeds of sales and dividends are deposited. It is also where funds are deducted when needed for purchase. Your StockMarketEye portfolio does not have to have a cash balance. 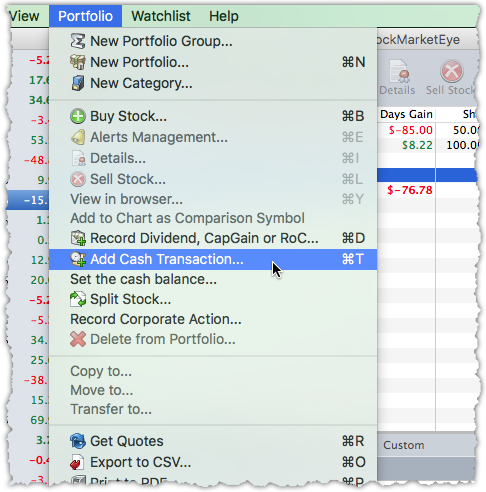 If you are managing a virtual portfolio or tracking a real portfolio that does not have a cash portion, you can change the portfolio’s settings to remove the “Cash” line. See the section, Portfolio Properties for more details. 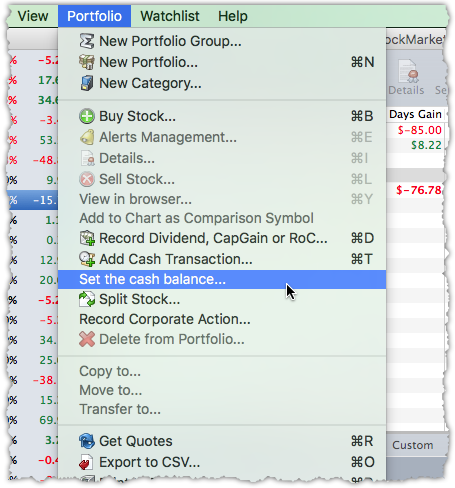 You can add or remove funds from the cash balance of your StockMarketEye portfolio at any time using the menu: Portfolio -> Add Cash Transaction. This will open the “Portfolio Cash Transaction” window as shown below. You should also specify a transaction Date and set the Amount of this cash transaction. If you want the Total Value of this transaction to be added/removed from your current cash balance, be sure to select “Update” for the Cash Balance field. If you want to set the cash balance to a specific value, you can edit the current value in-line to create a cash transaction whose value is the difference between the current value and the new value you entered. For example, if the current balance is 9617.07 and you would like it to be 10000, you can edit the cash balance value in-line, setting it to 10000. This will open the “Cash Transaction Details” window with the Amount set to 382.93. To start the in-line editing, click in the Market Val cell of the Cash line. 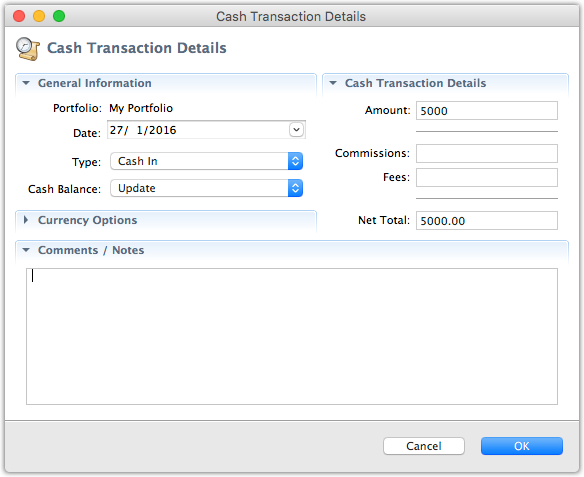 You can then enter the new cash balance value as shown below. When you press return, the “Cash Transaction Details” window will be opened and you can finish setting the details of the transaction, such as the Date. 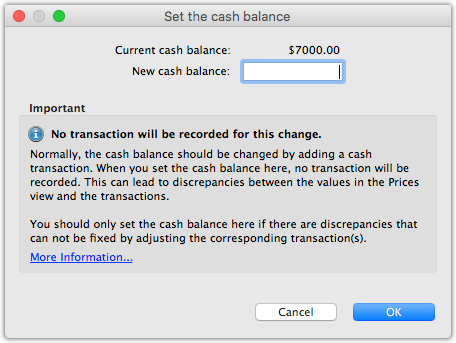 This opens the “Set the cash balance” window, where you can set the new value of the cash balance. Note that this will not record a transaction and thus there may be a discrepancy between your portfolio’s Prices view and the transactions. See the section on Rebuild Your Portfolio From Its Transactions for more details on how you can rebuild the Prices view, if necessary.